Over 20 islands are situated in an 80km chain off the north-west coast of the main island of Viti Levu and the islands are separated by spectacular cruising passages. The whole island chain is a cruising paradise with a new island, lagoon, reef or headland to explore every morning and afternoon. Because of their remote location, the waters are crystal clear and warm, the marine life prolific and the palm fringed beaches long, unspoilt and mostly deserted. Village life in the islands is very traditional and there are many customs to be honoured. Visitors should be aware Fijians are very modest. Knees and shoulders should be covered, hats removed and religious practices respected whenever visiting a traditional village. 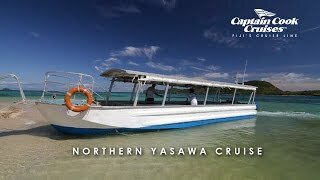 Captain Cook Cruises operates a 3 day cruise through the Southern Yasawa Islands, a 4 day cruise to the Northern Yasawa Islands and a 7 day cruise which combines the 3 and 4 day cruises and provides guests with the full tour. Relax on the luxurious small cruise ship, the M.V. Reef Endeavour as you meander through spectacular scenery with twice daily stop-offs to explore the local area.